Most of these cookie recipes are ones that everyone uses, They sure do taste wonderful and they are tried and true ones that we go back to each year. This year we each picked which cookies we wanted, that way we wouldn’t have all those extras just lying around for me to eat! 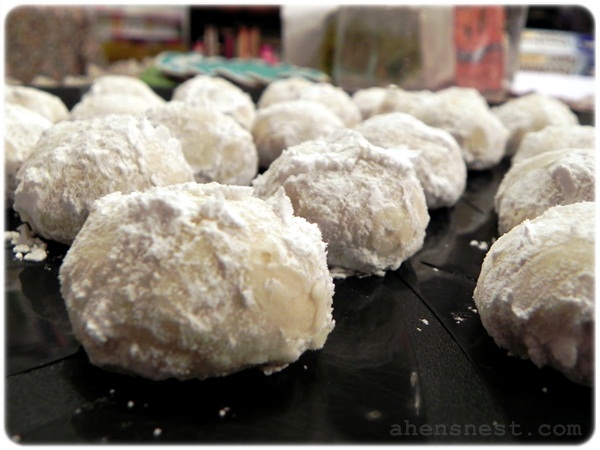 My very favorite Christmas cookie has always been the powdered sugar covered Russian Tea Cake. My Dad and I used to gobble them up by the plateful when I was little and I can still recall how we used to sneak the last ones. 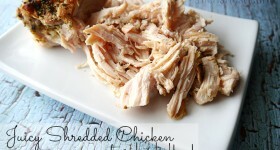 I always use the recipe from my old Betty Crocker Cookbook, yum! Also, instead of chopping the nuts, I pulse them in the food processor so there aren’t big chunks of nut, they melt in your mouth better that way! Next time I’m going to try this Polvorones recipe which seems very similar. I knew what Pie would want, so wasn’t at all surprised when she immediately said she wanted Peanut Butter Blossoms. They are her favorite cookie and so very easy to make. I always use the Jif recipe because that is our favorite brand of peanut butter. I do substitute butter in place of the Crisco though, they still turn out just fine. We decided to mix it up a bit and split the dough in half. We made the originals with one half and with the other half we made Reeses Pieces cookies. Just Bake the dough in greased mini muffin pans then press a mini Reeses Pieces cup into them after removing from the oven. YUM! Next time I might try this double chocolate version just for fun! The Sour Cream Sugar Cookie recipe we always make is one that I found in an ancient Woman’s Day magazine years ago in my Gramma’s basement. She had stacks of old magazines down there and I browsed through a few of them a few times when she let me borrow some. I’m glad I wrote this recipe down because they are the best-est, softest, yummiest Sugar Cookies ever! 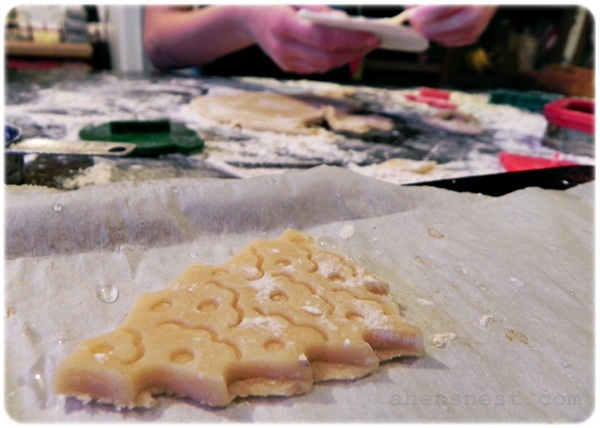 Unfortunately, we had an epic fail with our sugar cookie dough this year, they just did NOT taste right. I’m not sure if I, or my helpful baking partner, added too much sugar or flour or what…. I’m tossing them. 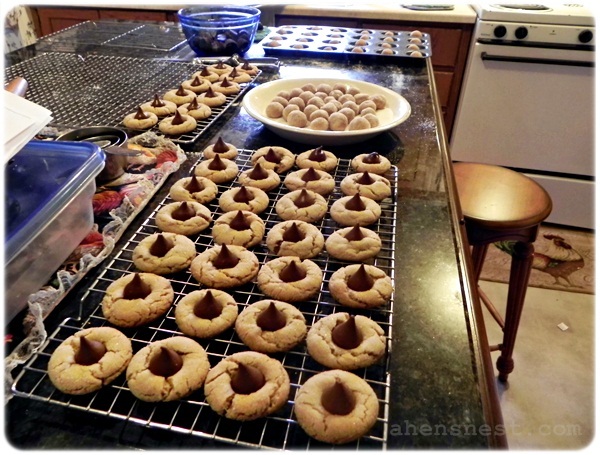 SO, then we made something that is so simple that no one could mess it up — Peanut Butter M&M Kisses from Simply Scratch’s blog. I saw them go by in my Facebook stream and they are very good! 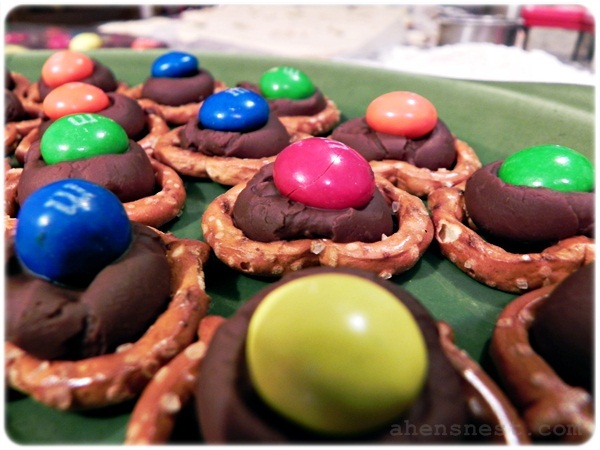 Pretzels, Hershey Kisses and Peanut Butter M&M’s… that’s it. We didn’t mess THOSE up! 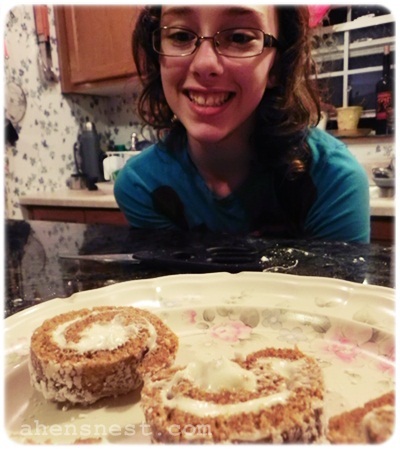 Last, but certainly not least, we made our annual Pumpkin Rolls! They are pretty much the same as any other pumpkin roll recipe. Super G. got the recipe from a homeowner years ago when he was remodeling their house near the holidays. We’ve made it every year since. Oh man, this made me hungry! Your cookies look delicious, and that pumpkin roll…mmm..! The powdered sugar covered Russian Tea Cake where the ones I always made using that same Betty Crocker cook book,for you & your dad..you both would keep eating them while I was making them, ya both love them so much and it’s one of my favorite too. While I was reading this, I notice that I made all these types of cookies every Christmas too. I use to make the pumpkin rolls too.Boston brown bread in coffee cans. That was Papa favorite. I would also make so many different kinds of fudge & candies too. One time I made the most wonderful best tasting fruit cake with cherry & pineapple & nuts..lost that reciepe..sure wish I could find that one & make it again. You & I did alot of cooking & baking when you where growing up. You spent alot of time with your Dad too & learn so much from him & or grandmother too. It’s nice you are doing this with your children too. God Bless, Merry Christmas & Happy New Year 2012! 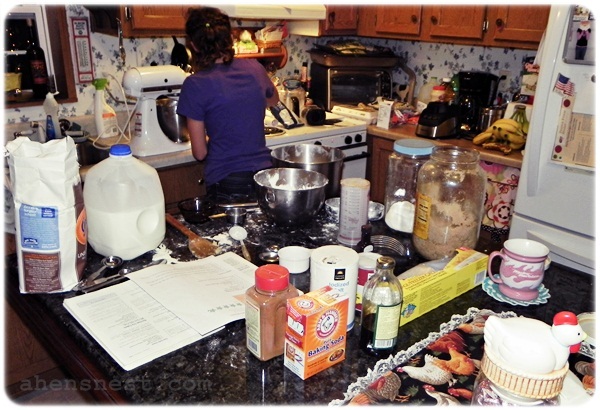 Love the photos of your kitchen – you guys are baking up a storm for sure! My back hurts just thinking about it, LOL! I look forward to baking with my daughter when she is older. Y’all accomplished quite a bit & all of those cookies look delicious! Wow, all that looks so yummy! Your daughter looks so proud of her finished product. I bet yall had fun! Oh believe me, I hate that mess too! This year we made all of the cookie dough one day, then baked all of the cookies the next day. It was so much quicker and only the first day was extra messy :) Happy New Year to you too Nichol! I’m so excited to see what 2012 brings! Next Post: Wishing you the Merriest of Christmases!